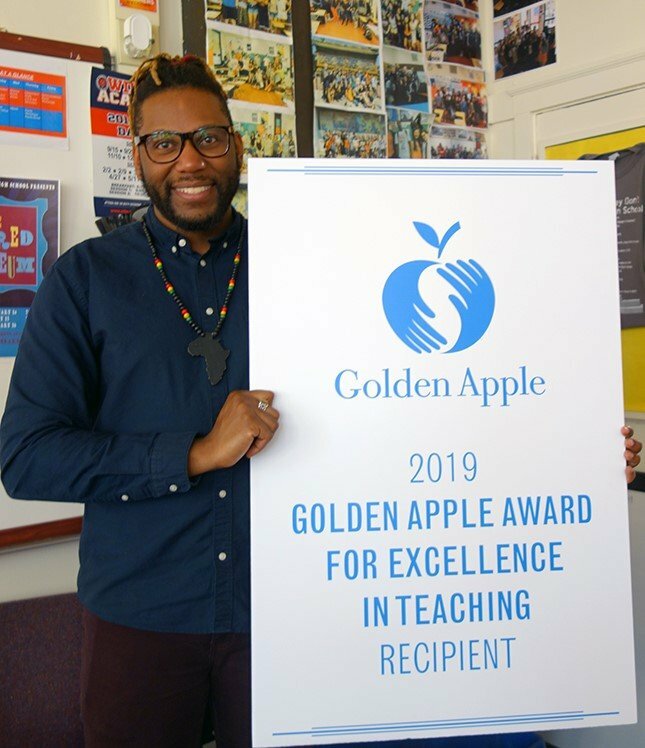 Evanston Township High School history and social sciences teacher Corey Winchester (SESP ’10) was selected Monday as a recipient of the 2019 Golden Apple Award for Excellence in Teaching. Golden Apple representatives surprised Winchester at ETHS Monday and presented him the award in front of his colleagues and students. Golden Apple works to develop and support teachers in Illinois, especially teachers at underserved schools. The award recognizes exceptional teachers who build a better society through teaching, according to the organization’s website. Winchester is one of 10 Illinois teachers to receive the annual award, which began in 1986. In addition, Winchester received the 2018-2019 Teach Plus Illinois Teaching Policy Fellowship. Winchester said in a January interview with The Daily that he is using the fellowship to work on recruitment and retention of teachers of color. Golden Apple selected 32 finalists, including Winchester, in February from more than 550 applicants. As an award recipient, Winchester will receive $5,000 and become a Fellow of the Golden Apple Academy of Educators, where he will support and mentor teachers, according to a release from the organization. Award recipients also receive a Spring Sabbatical sponsored by Northwestern University. When he received the reward, Winchester reflected on “all of the folks who invested in me,” according to the release. Winchester will be recognized on a one-hour Public Broadcasting Service TV program, which will be live-streamed on Facebook, on May 18.